Ernest Hemingway hosts a party in Havana’s legendary bar, La Bodeguita Del Medio. The invited singers are caught in a web of mixed emotions and mojito madness! MOJITO! 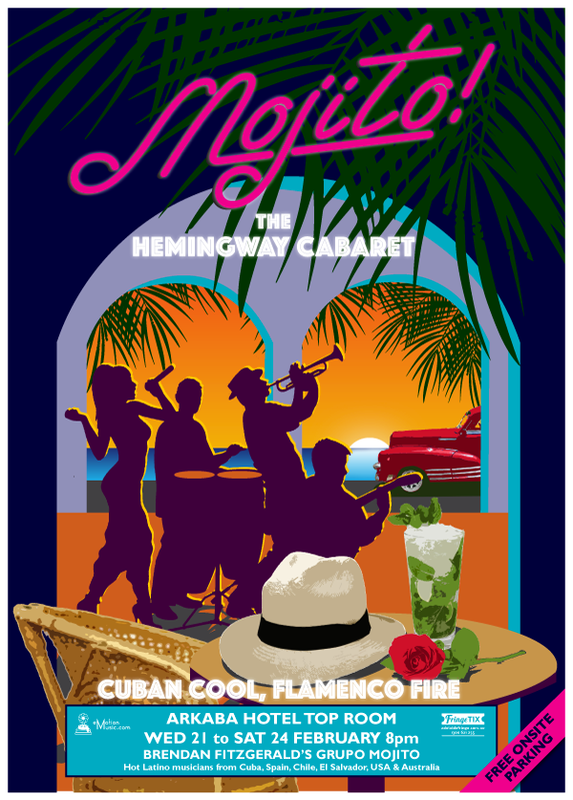 is a cabaret staged by a 9-piece orquesta of brilliant musicians who, like Hemingway, traverse the Latino world. A dynamic mix of Spanish and Cuban hits ensues: Oye Como Va; Quizas Quizas; Bésame Mucho & Historia de Un Amor. Join singer Nancy Ruth from Spain and Cuban trumpeter Lazaro Numa in Grupo Mojito to ignite a fiesta of fire and flair! Featured musicians include flamenco and Latin guitarist Alain Valodze, Chilean-born singer, Chris Cifuentes, percussionist Fabian Hevia and award-winning drummer, Alexander Flood together with the multi-talented dancer/actor/guitarist/singer, Diana Scalzi. Mojito! is produced by Brendan Fitzgerald and eMotion Music, creators of previous Adelaide Fringe hits, ‘Take Five’ and ‘Swing’.